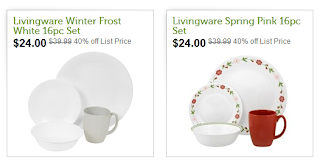 Woot: Corelle Dinnerwear 16 piece set just $24 (40% off the $39.99 list price). We've had the white set above in our family for something like 20 years! I remember being a teenager with butter-fingers and dropping the dishes and they wouldn't break. My mother gave me the set last year and I still use it daily. Excellent dishes! Definitely worth buying. Slim Jim: Send a Slim Jim to a Solider! Snazzy Swap: Kids' Clothing & More, Save Money! The Clymb: New Balance up to 60% Off! 2 Freebies Beneful, & Friskies. from Petco. 6PM: UGG Boots, Shoes, Accessories up to 70% Off!